Classic Dash panels are precision molded from a rugged UV-protected ABS material. They meet or exceed factory specifications. For most applications you have a choice of carbon fiber, brushed aluminum or matte black finish. Some fabrication may be required. Setting up and installing a complete Classic Dash is probably easier than you think. Most people prefer a “standard” package that consists of a 3-3/8″ speedometer and tach, plus 2-1/16″ diameter oil pressure, water temperature, fuel level and voltage gauges. We have developed complete wiring harnesses for the installations that are compatible with the factory wiring and commonly available tools and supplies will enable you to complete the installation —most can be finished in an afternoon. 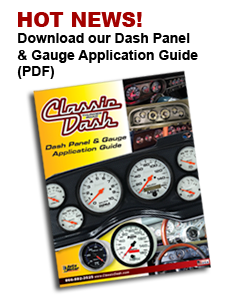 Classic Dash wiring kits come with a comprehensive, fully illustrated instruction booklet that will guide you through installing each gauge. If you have any questions, call (866) 882-3525 during normal business hours (M-F 7:30 AM to 4 PM Pacific Time) for personalized tech assistance. You can, of course, have any combination of gauges for your Classic Dash panel. Or you can get one of our auxiliary panels and add things like oil temperature, boost and other gauges. Staying informed as to what’s going on with your ride is very important and can help prevent serious engine and driveline damage. Customize your dash with one of the many styles of popular Auto Meter gauges or our own line of Thunder Road gauges. Select a gauge style that can contrast or compliment the finish of your Classic Dash panel.